There was a very sad post on SleepGuide.com recently that serves as a wake-up call for all of us. The poster announces that someone her daughter knows just died as a result of his sleep apnea. The person who died went without oxygen to his brain for almost 30 minutes, and despite the efforts of the EMTs he could not be revived. He hadn’t treated his apnea. Link to the full post (and responses by others in the forum) is here. 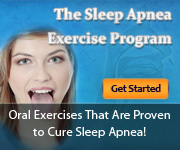 Moral of this sad story: if you have sleep apnea, don’t delay in getting it treated! Too many people think they’ll “just let it go”, and the apnea will cure itself. It won’t.